Our spicy Hawaiian Chili Pepper Pineapple Hawaii Fruit Paste is a great accompaniment for fine cheese, crackers, and wine. Serve as an appetizer or a desert. 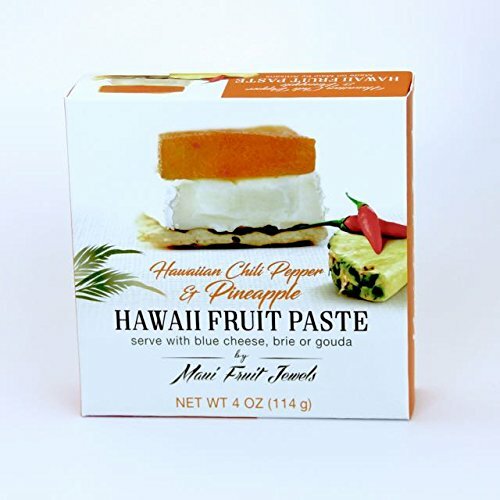 Sweet, tangy, and hot - Hawaiian Chili Pepper Pineapple Hawaii Fruit Paste made on the island of Maui by local artisans present the best of paradise. Store at room temperature, and refrigerate after seal is broken. One year shelf life from date of production at room temperature before seal is broken. Run pairing knife along the edge of the container to gently separate fruit paste from container. Gently invert the container and use knife to separate fruit paste from the bottom of the container. If you have any questions about this product by Maui Fruit Jewels, contact us by completing and submitting the form below. If you are looking for a specif part number, please include it with your message.